Yesterday I read The End of My Career, a new blog post by Barry Lyga. If you’re in the children’s writing and publishing field, odds are you’ve either read it or known someone who did and shared it on social media. It’s a good read. Barry talks a lot about the state of the industry and how the current publishing model makes it untenable for midlist authors to make a living through writing alone – something he’s been doing for the past decade. I was never able to sustain myself on writing alone. Never. I always had to freelance, or teach, or more likely do both. When I got tired of scraping by, I did what Barry fears most: I looked for “real work” (his words) and ultimately reentered the workforce after a nearly nine-year hiatus. Below, I’m reprinting that post in its entirety, typos preserved. Reading Barry’s post yesterday made me think there’s still some relevance to what I’d written nearly four years ago. It’s 3:30 a.m. as I type this, December 31, 2010. This year? Kind of sucked. Not just for me. This year kind of sucked for just about everyone I love. Breakups. Financial disaster. Deaths. Career turmoil. Health problems, family drama(s), dysfunction like you wouldn’t believe. For me personally: 2010 turned out to be the hardest year of my entire life. And that’s saying something, since 2009 was excruciatingly painful and, until 2010, had been the hardest year of my entire life. There are many, many reasons for this, none of which I speak of publicly. But here’s something I feel sort of comfortable talking about, and that is how 2010 was the year I decided I wanted to be done with the whole published author gig. People who know me weren’t shocked by this decision. People who really know me know that this was a decision a long time coming. Rewind: Joe’s birthday, 2008. I’d agreed to appear at a bookstore fundraiser for a public library (which, if you think about it, is a little twisted in and of itself). They stuck me in the cookbook section and left me alone. No one so much as talked to me for 90 minutes. I needed to use the bathroom but wasn’t supposed to leave my table until someone was there to cover it for me. Eventually the need to pee won out over the need to follow the rules. When I got back to the table, I realized I had 90 minutes left on my shift. I looked at a group of kids walk past me to play Guitar Hero at the station set up behind me, packed my bag, and left. I express concern over their general well-being. I should’ve spent the day baking a cake for my then-boyfriend (now _ance). Instead, I spent it feeling humiliated and bitter and resentful. For the record: I am not complaining. FACT: Being a working author is maybe 15 % about the writing. The other 85 % is mostly selling yourself to people in one form or another, through your blog, emails, listserv postings, conference appearances, signings, library things, school visits, etc. It is exhausting. FACT: Being a successful working author requires an enormous amount of networking (much of which falls into the tush-kissing category), self promotion (see above), and trying to come up with ideas for books that are both commercial and literary and will get your publishers excited to work with you. FACT: Being a lower midlist author (which, let’s face it, is pretty much what I was for 90 % of my career as a working writer) means feeling inadequate the majority of the time, praying for shelf/review space, and having to swallow editorial advice like “Do you think you could add a C Plot involving two teachers in love, like in CLUELESS?” All while still trying to sell yourself and kiss tushies and write books that will appeal to consumers who adore vampire books with excessive adverbs. To repeat: I am not complaining. I am simply stating my perceptions, based on nine years of experience. Complaining would mean that I was saying all of this while still trying to make it as a working writer. Last spring I became what is referred to as a Career Changer – someone who wakes up one day, realizes she can’t stand what she does, and decides to do something different. For me, this manifested in my job at the International Reading Association, where I am a membership specialist. This means I do a lot of stuff to attract new members and keep the existing ones happy. Currently I do a good deal of copywriting, which I really enjoy, and there are a lot of cool, creative things coming down the pipeline. Ironically, no matter how much I despise having to market myself, I’m really good at marketing other people and organizations I believe in (IRA being one of them). The icing on this cupcake is that IRA’s offices are so close to UD’s main campus that I get to teach one creative writing workshop each semester. Teaching creative writing is the thing that truly feeds my soul, as cliched as that sounds. I love my students. I love encouraging their talent. I love seeing them develop as writers. I love the days that I go into that classroom and laugh so hard I cry. This is also why I teach creative writing classes at the Brandywine Y. Well, that and the free gym membership. I still write. Not every day, or even every week, but I do write. I’m working on a deeply personal adult novel. What I have so far is really good. 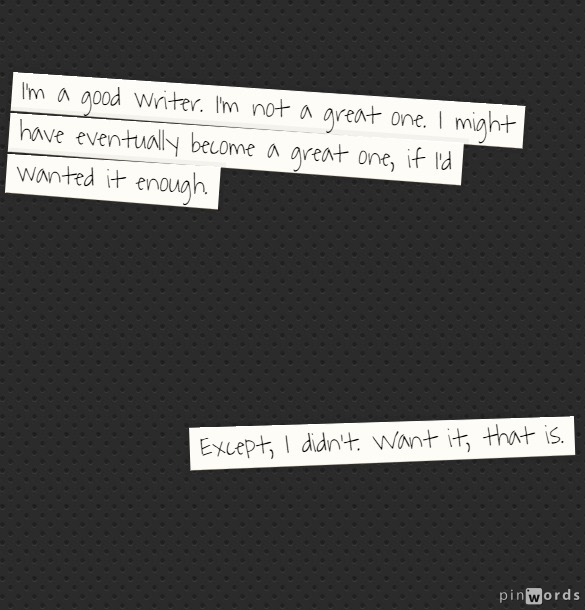 It makes me remember why I wanted to be a writer in the first place. But, I don’t have any books under contract, nor am I trying to secure any new contracts. And that makes me oddly happy. Tonight I climbed into bed with E. Lockhart’s REAL LIVE BOYFRIENDS, the fourth installment in the Ruby Oliver series. Emily is one of my favorite writers, and this book? It’s amazing. I read it cover to cover in one sitting. I cried at the end. When I came to the last page, I thought, “This book makes mevwish I were a better writer.” That’s pretty much the highest compliment I can pay to any author I admire. After I sold books, got published, and realized what it meant to be a working writer, a lot of that changed. I didn’t love writing so much. I agonized over having to do it. Deadlines were my main driving force. That and needing money to pay my bills. The joy? Gone. There are some things I enjoyed more than others. Writing the first Starlet book – that was probably the most fun I had writing anything. I’m still really proud of that book, despite the dated pop culture references. And I had a great time revising THE SWEET LIFE OF STELLA MADISON, but the first draft was murder and fraught with behind-the-scenes drama in both my personal life and my professional one. Before I decided to go to graduate school but after I left my crappy job at the crappy paper in Fort Wayne, Indiana, I had a meeting with my mentor and friend Cruce Stark. During this meeting he said something that I will never, ever forget. He said, “Just because you’re good at something doesn’t mean you have to do it.” He was referring to journalism, but as I agonized over whether or not I wanted to continue being a working writer I kept hearing those same words over and over and over. I’m a good writer. I’m not a great one. I might have eventually become a great one, if I’d wanted it enough. Except, I didn’t. Want it, that is. So now I work in membership for a professional organization devoted to literacy, and I run creative writing workshops for college kids and adult hobbyists, and I spend a lot of time cooking delicious things with my fiance, watching too much television, volunteering for the Girl Scouts, and petting my dog. And these things make me really, really happy. Several months ago, I said to my mom, “If my biggest complaint is that I don’t have enough time to see all of the people I care about who care about me, then in the grand scheme of things, that’s not so much a problem as it is a privilege.” Meaning, I’m lucky that there are so many people I care about who care about me, even if we don’t talk or see each other as much as we’d like. And it’s not like I’m never going to write another thing. I just spent 77 minutes writing this blog post. My essay, “Informed Consent,” will be included in the DEAR BULLY anthology HarperCollins is putting out in the fall, which is something I’m really excited about. Plus I really am working on an adult novel, and I really do believe it’s some of the best writing I’ve ever done. Maybe I’ll publish it, but then again, maybe I won’t. And I’m okay with that. I’m beyond okay with that. As for 2011: I’m hoping it’s better than 2010, not just for me but for all of the people in my life who’ve been struggling with unspeakable things. For me, personally, I feel like 2011 is already better. Because I’m more sure of who I am than I’ve ever been, and there’s something to be said for that. There’s a lot of muck that still needs to be sorted through. And my house is still a hot cluttery mess that could seriously benefit from me hiring a housekeeper. I still want to lose another 80 pounds, still want to finish the craft room that’s been 3+ years in the making, still want to create a filing system that makes sense and puts every paper in its place. I’m still not entirely sure how I plan on accomplishing all of the above while maintaining personal relationships and working three or more jobs. As I look forward to the year ahead, I am hopeful. This person I am? I like her. I like her a lot. I want to like her even more, and I want to spend the next 365 days doing things that will help me achieve this goal. To be the best Lara I can possibly be, and to focus on the things that actually make me happy instead of things that are supposed to make me happy. Changing careers was a major step in that direction.